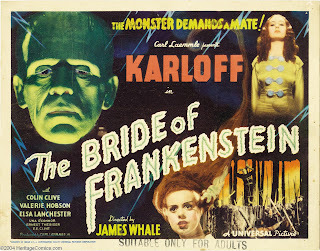 By the mid-1930, the horror film was in a virtual coma, killing time between its initial fever of box-office excitement that began with Universal’s Dracula and Frankenstein (1931-32) through a gradual slump until revitalisation again in 1938 thanks to the surprise hit double-bill pairing of the two by an enterprising cinema owner in New York. There were sporadic twitchings of life though, such as The Mummy and the impressively consistent run of splendid James Whale-directed films. 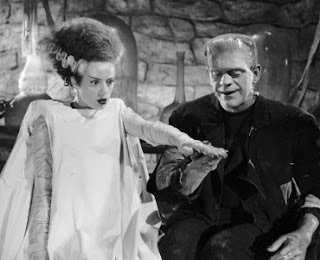 After Frankenstein, he had continued to develop his signature combination of horror and dark subversive humour in The Old Dark House, The invisible Man and then his crowning achievement in the genre, The Bride of Frankenstein. This was to be his swansong in horror and many fans regard it as one of the very greatest horror movies of all time. Universal had wanted to put Boris Karloff into a sequel called Return of Frankenstein, based on a treatment by Tom Reed, going so far as to design posters for it. The title was kept until the actual sequel began. Whale was resistant to being involved having felt he’d already fulfilled his intentions with the first film. He was persuaded to make a sequel so long as he could exercise personal control over the screenplay development, credited to William Hurlbut and John L. Balderston, and many of its ideas (the Shelley prologue and bottled miniature people are his, for example). 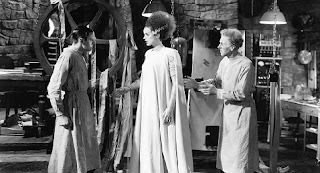 In writer Paul M. Jensen’s more recent interview with Elsa Lanchester, she told him that Whale had insisted to the studio that she play both Mary Shelley and the Bride, performances that create well-crafted bookends to the film. The prologue is a treat of an opening, tying together the story’s heritage with its modern cinema telling. As we saw in the discussion of 1931’s Frankenstein, Mary Shelley conceived the novel during a holiday stay at Villa Diodati on Lake Geneva in 1816 as part of what became a remarkable powerhouse foursome of literature gathered together. Lord Byron and her husband Percy Bysshe Shelley were already poets of great acclaim. Mary Shelley was yet to begin her writing career and Byron’s friend Dr John Polidori would go on to publish his short tale The Vampire, the very first mainstream vampire story published, that same year. The narrative timeline that follows is interesting. Whilst Bride picks up so closely from the end of the original Frankenstein film that the burnt-down windmill of the climax is still smouldering, it backtracks just enough to show Colin Clive’s Henry Frankenstein being retrieved from the wreckage. (We saw him safe at home at the end of the first movie). The debris is surveyed with shrill-voiced shrewishness by that most combatively vivid villager from The Invisible Man, Una O’ Connor, as Minnie – a favourite of Whale’s rep company of regulars. She undermines the authority of the Burgomaster in the form of another favoured player from that movie, E.E. Clive, a specialist in nincompoops of authority. There’s a brief glimpse as well of Karloff’s Monster, emerging from his encasement in a wall of mud to save a villager, but more of him later. By showing Henry’s rescue, Whale expands on the hurriedly-filmed ending of Frankenstein which merely showed him bed-ridden in a long shot – due to a last-minute decision forced on him by Universal to not kill the scientist off. Henry is doted on by his wife Elizabeth, an impressively mature (if stagey) 17 year-old Valerie Hobson who replaced Mae Clarke. She is concerned for her husband, whose post-traumatic stress has him “tossing in your delirium”. Henry expresses regret at his insane God complex of tinkering with life: “Perhaps death is sacred and I have profaned it”. Clive’s heartfelt sentiment could almost be a mouthpiece for the censor here who was hugely vexed by the perceived quasi-blasphemousness in the first film. Never fear though, for the slumbering body of this sequel is about to be injected with an all-new treatment, courtesy of Henry’s old mentor Dr Septimus Praetorius. The name alone reeks of Victorian Gothic and embodied by Ernest Thesiger, he is a splendidly camp queen of a gentleman, severely waspish and bearing a permanent lofty sneer at the world. Though allegedly Claude Rains and Lugosi were considered, Thesiger is prissy perfection in the part and in real-life was Whale’s own mentor from his theatre days. Praetorius is a terrific component in Bride as he allows Henry to have his experimental cake and eat it. By blackmailing Henry into continuing his work, it allows the protégé to writhe on the hook in moral torture (Clive’s most compelling actor quality) whilst appealing to his still-burning desire to perfect the rejuvenation of dead tissue. Under the guise of a coerced seduction of Henry‘s vulnerable mad scientist, Whale must have relished the chance to throw blasphemy in the face of Joseph Breen, head of the Hays office. The Production Code of censor approval was in full effect now, forensically combing through Hollywood films for anything remotely controversial, which made something of a game for the director. His subversive side enabled Henry to get away with the almost messianically hot: “It may be that I am intended to know the secret of life. It may be part of the divine plan”. Even when the Breen office forced a line-change, there were still ways to convey the underlying meaning. At script-approval stage, they vetoed Praetorius’s intended: “Follow the lead of nature or God…if you like your fairy tales” with the less incendiary : “…if you like your bible stories” but Thesiger caps the line with such scorn, it has the same derisory effect even in censored form. Later, there is even a toppling of religious iconography in Karloff’s knocking over of a graveyard bishop’s statue, not to mention the Monster being inbued with Christ-like suffering if you’re inclined to read it subtextually that way. Praetorius seals the deal with the famous quote that begins this article and then trumps the shadowy grandeur of his entrance with an illustration of his perversely cruel nature and a touch of Whale’s offbeat sense of humour – the mythical miniature characters under glass that he has bred. They are a parade of satirised icons mostly of the fairy tale world: the greedy King, the Queen, the widow’s-peaked Lugosi-esque Devil, the Mermaid and, for sheer mischief, an Archbishop. All are parodied in their pantomime gesturing and pip-squeak voices, the special effects pulling off a smooth transition as the King is lifted with tweezers by Praetorius and dumped back into his own jar. We then switch focus to Karloff’s Creature, now free and roaming the countryside – a superbly realistic studio backlot set of which Whale was justifiably proud. He lumbers through the forest in search of the basic needs of all – food, shelter and companionship. He finds none of the first two with the frightened gypsies but strikes lucky at the home of a hermit (O.P. Heggie) leading to another of the celebrated highlights of the film. The tenderness of Heggie’s kindness toward the Monster is very moving, not least for its utter lack of irony or condescension. The blind old man finds a kindred spirit in Karloff’s fellow outcast, offering him the comforts of his soup, wine and cigar, the only person ever to recognise the Monster’s inner humanity. It is a clumsy negotiation between them and all the more touching for Heggie’s soothing of Karloff’s fear of fire and the disarming directness of their mutual understanding. “Alone…bad. Friend..good” grunts Karloff, his deep rumbling utterances somehow enobling him. Karloff always had misgivings about giving voice to the Monster, fearing it would detract from the poetic mystique of his performance, and although it was a device never used again, here its beguiling simplicity of expression gives extra poignancy. The scene also contains an example of Franz Waxman’s finely-judged music score, delicately adding a biblical, saintly atmosphere to the hermit and his guest. Such is the scene’s depth that even when lovingly pastiched by Gene Hackman and Peter Boyle in Mel Brooks’ Young Frankenstein, ["Wait, I was gonna make espresso..."), the affection for the relationship is still evident. Look out for a very young John Carradine as one of the hunters who cruelly breaks up the temporary friendship. It is no coincidence that The Bride of Frankenstein brings two misfits together like this. Indeed all of the film’s principal players barring Elizabeth fit that description, whether by circumstances (as these two must endure, along with Lanchester’s Bride thrust into the world) or inner direction (Praetorius and Henry Frankenstein’s transgressive scientific views render them apart from the mainstream world). Whale had an innate sympathy for those who are different, living as a gay man in a prejudiced society, albeit more comfortably than Colin Clive could with his own homosexuality. On the subject of comforts, Boris Karloff was by now enjoying some influence in his career. The lowly Universal contract player who shot to fame just four years before as the mad scientist’s ‘off-spring’ was exerting a star’s persuasion not only on behalf of the Hollywood actors’ community in his sterling work for the new Screen Actors Guild, but on a personal level he negotiated to reduce the punishing hours for himself spent undergoing the make-up every day for the Monster. Instead of the time-consuming layering on of cotton and collodium by resident genius Jack Pierce, Karloff was given a single piece rubber forehead as a short-cut. His new prosperity had also generously accorded him a slightly more well-fed look than the cadaverous face of 1931, so his appearance was rounder. The aftermath of the mill fire shows in the burns Pierce applied to his hands and face and crew-cut hair (which gradually grows more over the evolving story). The great cinematographer John J Mescall was another of Whale’s long-standing collaborators who used clever lighting techniques to enhance Karloff’s blue-green skin tones provided by Pierce. 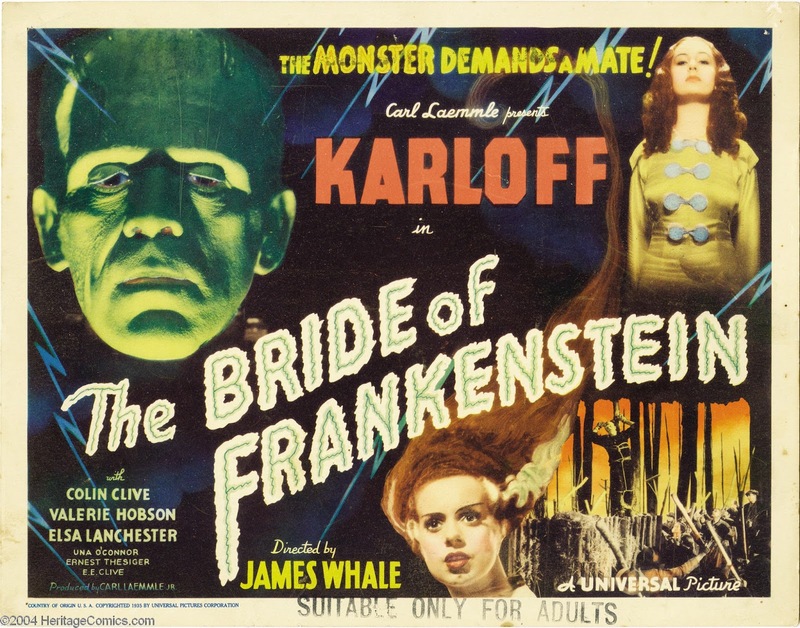 Film historian Scott Macqueen discusses this in She’s Alive (Universal’s informative Bride documentary): “If the monster were filmed wearing this shade of greasepaint on ortho-chromatic film…with blue gel light, he would read as dead white. To increase the contrast, red was mixed with the other actors’ make-up sharing scenes and train warmer lights on them” – thus re-creating that all-important walking corpse veracity. Mescall was renowned for his overall shooting style nicknamed ‘Rembrandt lighting’, simulating the great painter’s work by using a central light with cross lights from opposing directions to add contours to faces as well as Charles Hall’s wonderful sets - Praetorius’s shadowy first entrance is a striking example. Another surprising meeting of minds in the film is the first encounter between Praetorius and the Monster. Thesiger sits eating and drinking at night in the cemetery vault, using a coffin as a table for his bread and wine. The candlesticks and skull décor add a darkly funny gothic tinge as he guffaws at the world between mouthfuls. When Karloff appears, the sequence becomes an imitation of the hospitality he has just enjoyed – indeed Praetorius greets him with the amusingly unruffled composure of a new travelling companion. “I thought I was alone. Good evening”. What the Monster doesn’t know is that a hidden agenda bubbles away now inside his new host, one that will use the Creature as leverage to force Henry into creating a female version of the revived dead. This brings us to the famous climax of the movie as the Bride is unforgettably brought into the world. Charles Hall’s high-ceilinged set for the laboratory is magnificent, showcasing the return of Kenneth Strickfaden’s astounding equipment such as the ‘cosmic defuser’ and the awesome spiralling coil that connects the lightning above to the stretcher bearing Lanchester to the heavens. Her birth is sensational. “She’s alive – alive!” crows Clive, even more effusively than when he created her male ‘suitor’. Lanchester stands imperious, a Queen gowned in flowing white before her subjects. The actress gifts her role with memorable details: the bird-like gaze flitting about her in wonder, staring up at the moonlight. Then comes the awful moment of truth as she surveys Karloff and emits a silent almost feline yowl of disgust. “She hate me – like others” the Monster poignantly utters before literally bringing the house down with one of the great epic horror movie closing lines: “We belong dead”. Lanchester hisses with venomous defiance and is gone, a truly stunning performance that resonates beyond her incredibly brief appearance (no more than five minutes) into the history books as the most vivid female horror character ever represented. Before the castle detonates, this section of the film is also appreciable for Waxman’s music cues. There are effective stings that augment the mood – the lone drum that imitates the heartbeat of the comatose Bride and the grotesque parody of wedding bells as she stands triumphantly alive. The composer was careful to attribute evocative leitmotifs for each character, even to remind us of them when off-screen – Elizabeth’s romantic melody, the Monster’s three-note ‘da-da-da daaa’ that replicates his growl and the graduating violin shiver when Praetorius lurks. In advance of its release, there were roughly fifteen minutes of scenes excised from Bride. Elsa Lanchester’s cleavage was considered revealing enough to warrant judicious edits to the prologue, but the main bulk of cuts consists of an entire ten-minute sub-plot involving Dwight Frye as the nervy criminal body-snatcher Karl. 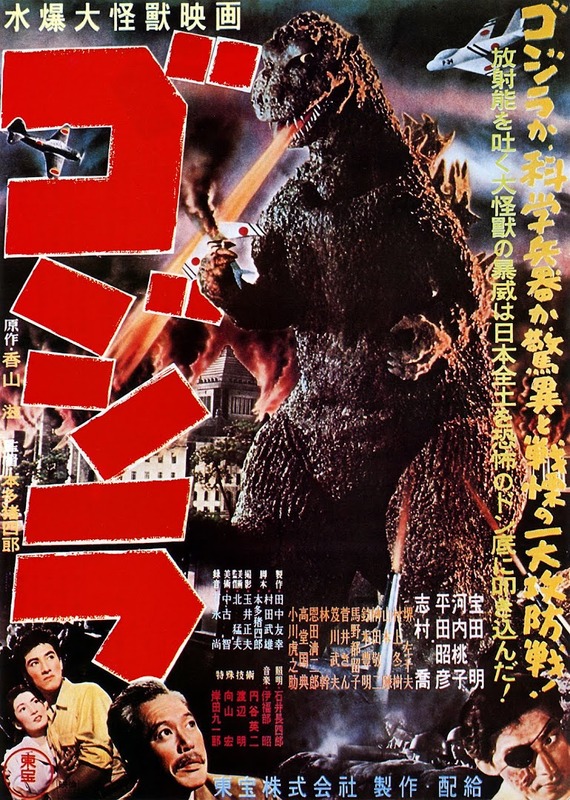 To boost audience sympathy for the Creature, Whale filmed a whole section whereby Karl kills his aunt and uncle and attempts to frame the Monster for the murders. Ultimately the sequence proved an unnecessary hindrance to the pace and was dropped. Frye would still have been grateful to Whale’s characteristic loyalty though; Karl was a composite of various parts rolled into one by the director to give his admired friend more screen time in the rest of the film. (We still have the pleasure of his jittery defence for procuring the Bride’s corpse: “It was a very fresh one!”). The final release print of the film is masterfully edited by Ted Kent, leaving no fat in its prime-cut 75 minutes. In spite of the great success of The Bride of Frankenstein, the increasing burden of debt was too great to save Universal from being sold a year later to new owners who lacked any artistic taste or ambition. Boris Karloff showed the wise career judgement which may have eluded his contemporary Bela Lugosi in only agreeing to one more sequel as the Monster, Son of Frankenstein in 1939. He foresaw the descent into bad jokes and worse sequels. The lack of Whale’s input made the law of diminishing returns an inevitability as the franchise wagon rolled on. Whale became disillusioned with the industry itself and several years later after Showboat and the failure of The Road Back - his sequel to All Quiet on the Western Front - he enjoyed a comfortable retirement before suffering debilitating strokes that caused him to commit suicide in 1957. He never lived long enough to enjoy the great critical re-appraisal of his contribution to cinema (and horror especially) yet Bill Condon’s affectionate biopic Gods and Monsters (1998) goes some way to pay homage to James Whale’s talent and sensibility decades after his life. This is such a fantastic piece, Ian! Great writing and depth. From what I've understood about Lugosi, he was one bad negotiator. So desperate to play Dracula, he took an amazingly low offer and he never bounced back from that. I think he had no choice but to do another sequel to keep food on the table. Great research and wonderful work! Thanks again. Yes, you're right about Lugosi. I covered this unfortunate aspect of his unequal bargaining power in my DRACULA review below - and the book BELA LUGOSI IN PERSON details the many increasingly threadbare iterations of DRACULA stage tours he kept plugging away at until he died.